It's just a bit of fun, but it does mean I get to make party decs and all the trimmings- which means DIY- which means new posts for you! 1. Draw around your template onto your card or thick paper. You can download my template HERE. Then cut out. 2. Stick it to the back of your chosen wrapping paper design. Make sure you glue right to the edges. Keep it flat under some books until it dries, then cut out. 3. Use your craft knives to carefully score down the glue tab edge on the wrong side. Make sure you don't go through the card. 4. Using your glue gun, curl the glue tab edge round underneath and stick it on the inside to create your cone shape. 5. Use a pin to pierce a hole on each side of the hat. Then use a knitting needle to make the hole bigger. 6. Thread your elastic through the holes. I used my dog as a model to check the length on him, don't make it too tight! 7. 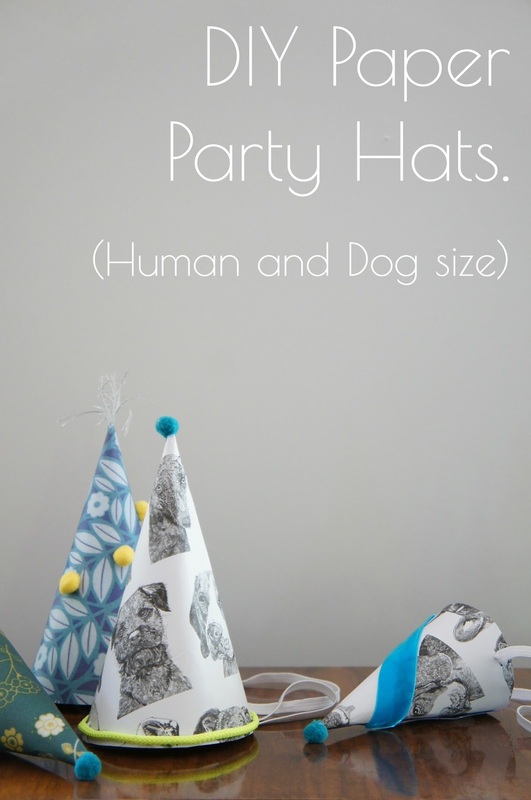 Decorate your hats with pom poms, string, washi tape and anything else you can find. Then you're ready to go! Dog print wrapping paper from Ros Shiers, available HERE.